Suran chips recipe or Yam chips – Thinly sliced, boiled suran aka elephant foot yam is deep fried till crisp. It is seasoned with salt, pepper and lemon juice. This is one of my childhood favorite snacks that I eat during fasting or vrat. My mom makes it as an evening snack. Using this root vegetable, she also makes suran ki sabji and suran khichdi. For making suran chips, first suran is peeled and thinly sliced. Then it is cooked for few minutes in the boiling water. After that we will pat dry all the pieces and will deep fry them. As soon as it comes out from the oil, sprinkle salt and pepper and squeeze fresh lemon juice. Eat it and enjoy!! Addition of lemon juice is must. Suran is the kind of root vegetable that may create an itchy feeling in your throat. But the lemon juice will prevent it. Not only lemon juice, any souring agent e.g. tamarind, yogurt will prevent the itchy feeling. So for the sake of flavor and prevent this itchy feeling, do not skip the lemon juice. These are slightly crispy and yet soft. If not served hot/warm, it will get more softer and lose its crispness. 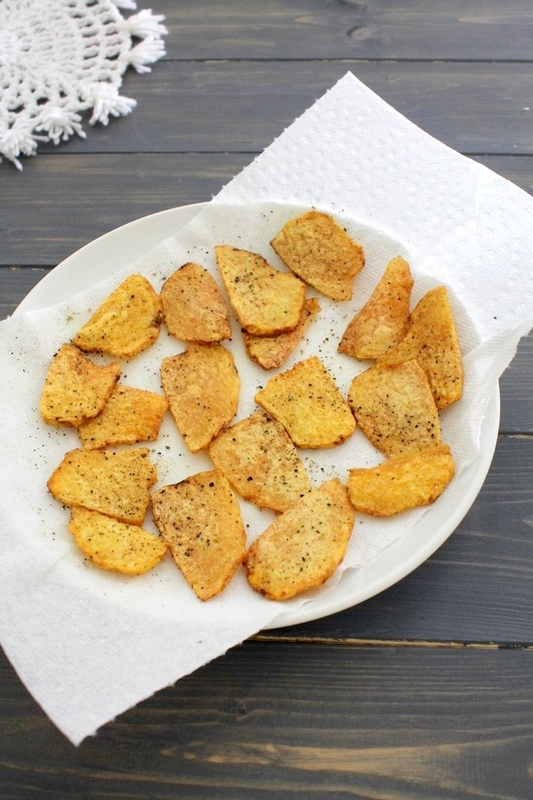 Similar chips recipe on the blog that can be eaten during vrat – Arbi chips. 1) While cutting and peeling the yam, many times it gives the irritation or itchy feeling to your hands, so grease your hands with oil and then continue. 2) Peel the suran and if not using right away then soak into the water. 3) Cut into thin slices. Keep them into the water. 4) The thickness of it should be ⅛ inch thick or similar to the thickness of the quarter coin. 5) Now take 3-4 cups of water in a pan or patila on medium-high heat. Add big pinch of salt and bring it to a boil. Once it starts rolling boil, add sliced suran and cook for 5 minutes. 6) After five minutes, remove it from the boiling water and drain well. 7) Spread the cooked slices on the paper towel or kitchen towel. So it will absorb the excess water. 8) Also using another paper towel, pat dry all pieces. It should be dry completely in order to get the crispy fries. 9) Heat the oil in a pan on medium heat for frying. Once hot add suran chips. 10) Keep moving and turning around to get the even browning. 11) Once fried and becomes crispy, remove it using slotted spatula. Few of them were very thin so they got fried quickly. 12) While it is still hot/warm, sprinkle some salt, pepper and sugar. 13) Freshly squeeze the lemon juice. 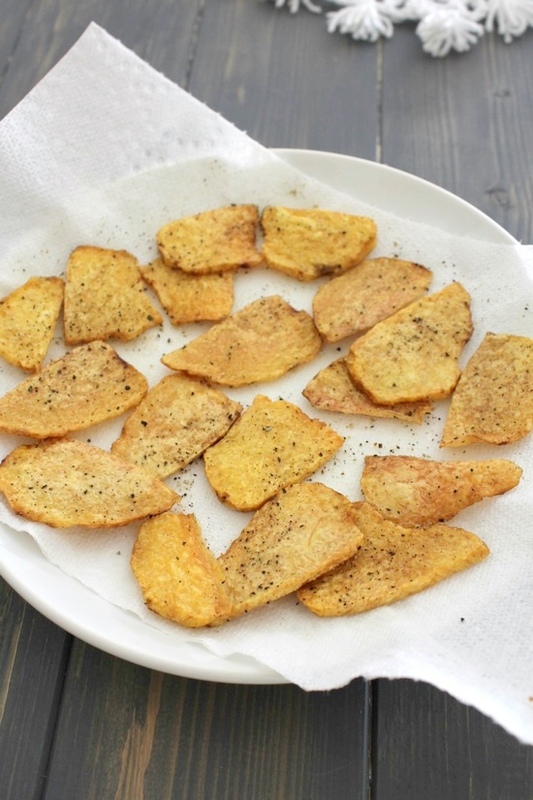 14) Repeat the same for rest of fried chips. Serve them right away. Otherwise it will become soggy. Serving suggestion: this suran chips can be served as a snack any time of the year. But this is specially consumed during the fasting or vrat or upwas. Suran chips recipe or Yam chips – Thinly sliced, boiled suran aka elephant foot yam is deep fried till crisp. Grease your hands with oil and then continue. Peel the suran and if not using right away then soak into the water. Cut into thin slices. Keep them into the water. The thickness of it should be ⅛ inch thick or similar to the thickness of the quarter coin. Now take 3-4 cups of water in a pan or patila on medium-high heat. Add big pinch of salt and bring it to a boil. Once it starts rolling boil, add sliced suran and cook for 5 minutes. After five minutes, remove it from the boiling water and drain well. Spread the cooked slices on the paper towel or kitchen towel. So it will absorb the excess water. Also using another paper towel, pat dry all pieces. Once hot add suran chips. Keep moving and turning around to get the even browning. Once fried and becomes crispy, remove it using slotted spatula. While it is still hot/warm, sprinkle some salt, pepper and sugar. Freshly squeeze the lemon juice.